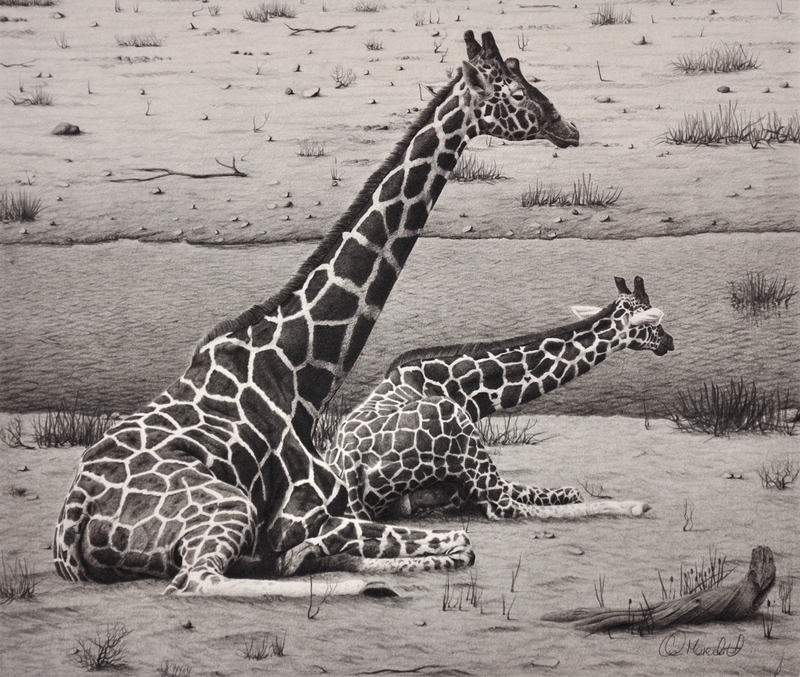 Clive Meredith - Giraffes – Cow and Calf - Online gallery supplying original fine art. Trending Modern British and Contemporary Welsh. Available for sale from Big Sky Fine Art; this original drawing by Clive Meredith.<br> The drawing is presented and supplied in its original frame and behind glass. <br> Previously with Collier & Dobson, Fordingbridge, Hampshire.<br> The drawing is signed lower right.<br> <br> One of Britain’s foremost contemporary wildlife artists, Clive Meredith is well known for his detailed portrayals of wildlife from Britain and abroad. His work is now very much in demand and he has a large collector base. His art has been extensively published with over 50 limited edition prints. Note that the work offered here is an original, on which such prints are based.<br> <br> Meredith is entirely self-taught and has worked as a professional artist since 1993. His initial interest in wildlife and the countryside was fostered in his early years as the son of a dairy farmer in Shropshire. He spent many hours in the countryside around his hometown of Shrewsbury bird watching and larking about in the River Severn and its streams. <br> <br> Working in both graphite pencil and oils, observation is vital to Clive’s working practice. Each drawing reveals meticulous attention to detail, achievable only by hours spent in the field observing and photographing subjects in their natural habitat. As a result Clive has become renowned for the stunning realism of his images and an incredibly assured ability to inject real life and character into his works.<br> <br> Recent accolades have included a ‘highly commended’ award for works exhibited at the Mall Galleries in London in 2012 and 2013. In 2010 Clive was named Wildlife Artist of the Year by Wildscape magazine after winning the prestigious annual competition with his image 'The Egret pool' and he also appeared as a finalist in the DSWF (David Shepherd Wildlife Foundation). Clive is a member of Marwell International Wildlife art society, the Pencil Art Society and the RSPB.<br> <br> His work has been featured in many publications including Artists & Illustrators Magazine. In 2010 his work was chosen to appear in a new book ‘Drawing and Painting Birds’ by author and artist Tim Wootton alongside the works of bird art luminaries such as Tunnicliffe, Bateman and Busby. <br> <br> Today Clive Meredith’s work can be found in galleries and homes throughout the UK and Worldwide. <br> <br> This stunningly realistic drawing of pencil on paper looks like a photograph of African wildlife, but isn’t! It shows a mother and baby giraffe, a cow and calf, sitting together beside a watering hole or shallow river in an otherwise barren landscape. The mother sits protectively, even lovingly, over her calf, as it keeping watch. This is the sort of scene that one might be privileged of observing whilst on safari. Available for sale from Big Sky Fine Art; this original drawing by Clive Meredith. The drawing is presented and supplied in its original frame and behind glass. Previously with Collier & Dobson, Fordingbridge, Hampshire. The drawing is signed lower right. One of Britain’s foremost contemporary wildlife artists, Clive Meredith is well known for his detailed portrayals of wildlife from Britain and abroad. His work is now very much in demand and he has a large collector base. His art has been extensively published with over 50 limited edition prints. Note that the work offered here is an original, on which such prints are based. Meredith is entirely self-taught and has worked as a professional artist since 1993. His initial interest in wildlife and the countryside was fostered in his early years as the son of a dairy farmer in Shropshire. He spent many hours in the countryside around his hometown of Shrewsbury bird watching and larking about in the River Severn and its streams. Recent accolades have included a ‘highly commended’ award for works exhibited at the Mall Galleries in London in 2012 and 2013. In 2010 Clive was named Wildlife Artist of the Year by Wildscape magazine after winning the prestigious annual competition with his image 'The Egret pool' and he also appeared as a finalist in the DSWF (David Shepherd Wildlife Foundation). Clive is a member of Marwell International Wildlife art society, the Pencil Art Society and the RSPB. His work has been featured in many publications including Artists & Illustrators Magazine. In 2010 his work was chosen to appear in a new book ‘Drawing and Painting Birds’ by author and artist Tim Wootton alongside the works of bird art luminaries such as Tunnicliffe, Bateman and Busby. Today Clive Meredith’s work can be found in galleries and homes throughout the UK and Worldwide. This stunningly realistic drawing of pencil on paper looks like a photograph of African wildlife, but isn’t! It shows a mother and baby giraffe, a cow and calf, sitting together beside a watering hole or shallow river in an otherwise barren landscape. The mother sits protectively, even lovingly, over her calf, as it keeping watch. This is the sort of scene that one might be privileged of observing whilst on safari.